Come and relax on your own cozy porch swing at this Bay Woods home. This country style home has tons of charm and is not your cookie-cutter subdivision house - with its expansive front porch and dental wood roof trim. 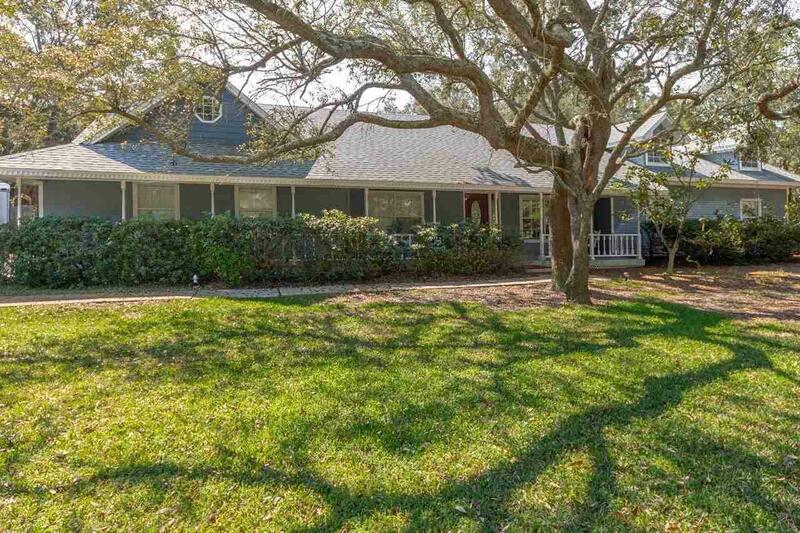 The home sits on a half-acre lot with many beautiful mature live oak trees which provide lots of privacy and a feeling of having your own piece of country paradise. There is plenty of room for friends and family with 4 bedrooms and 3 full bathrooms. Upon entering, you will notice the character and details this home has to offer from the wainscoting and chair rails to the crown molding and ceiling details. The family room is spacious and allows for your large sectional couch and favorite cozy recliner while enjoying your custom fire place. The galley style kitchen is perfectly located between the large formal dining room with front yard views and a breakfast nook with bay window that overlooks your pool and patio area. The sizeable indoor laundry room has tons of cabinetry and storage. The master bedroom also has another fireplace, walk-in closet, pool view, and an en suite bathroom. The additional bedrooms are all a generously sized. There is a private bedroom apart from the others with ample closet space and its own private full bathroom, complete with claw foot tub, perfect for your visiting guests. There is an enclosed Florida room lined with wrap-around windows and built-in shelves and cabinets. Enjoy the hot summer days lounging on the back patio and deck or floating in your pool. The back yard is the perfect place to let the kids and pets run and play. There is plenty of attic storage above the garage with pull down stairs and additional peace of mind with the home generator. This home is conveniently located near shopping and the new Tiger Point Pavilion, restaurants, Tiger Point rec park and playground, near bases, beaches and A+ rated schools. This home will not stay on the market long so call for your showing today.